• Executive Secretary from 2006 to 2012. • Chairman of the Awards Sub-Committee from 2003 to 2014. • A member of the South Australian Chapter Committee from 1999 to 2013. • Chairman of the Technical Committees for each of the year 2000 (Adelaide) and 2004 (Darwin) Conferences on Railway Engineering. Under John’s term as Chairman of the Awards Sub-Committee, the number of awards offered by the RTSA was increased from three (Individual, Company, and Undergraduate Thesis) to seven awards (with the new awards being Young Railway Engineer, Postgraduate Thesis, Graduate Engineer, and the Annual Rail Scholarship Award), with a total annual budget in excess of $70,000. John also oversaw the updating of award conditions from time to time and ensured that each of the scores of entries were given meticulous attention by himself and each member of the Awards Subcommittee. He also took on the responsibility of conveying the results to the successful and other candidates for each award. 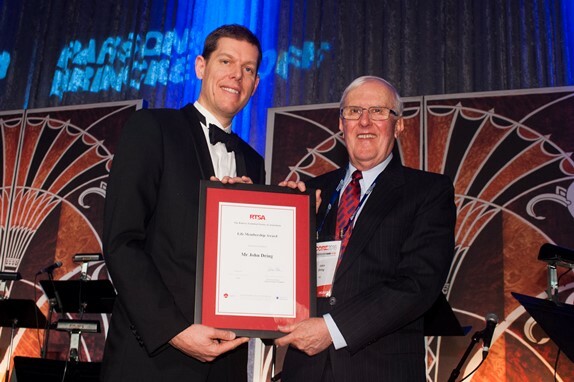 John’s dedication and many years of service to the RTSA is exemplary and it is now highly appropriate that he receives the well deserved award of Life Membership of the Railway Technical Society of Australasia.